Mondovi is a city in Buffalo County in the U.S state of Wisconsin along the Buffalo River The population was 2,777 at the 2010 census. The School District of Mondovi covers approximately 204 square miles and includes all of the City of Mondovi andall or portions of the following townships: Canton, Modena, Mondovi, and Naples in Buffalo County; Brunswick, Drammen, and Pleasant Valley in Eau Claire County; Albany in Pepin County; and Rock Creek in Dunn County. 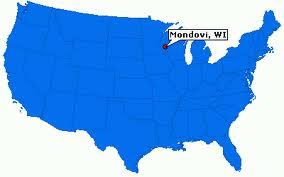 The School District of Mondovi is a part of CESA (Cooperative Educational Service Agency) #10. There are two schools in the district including Anthony Elementary (currently closed) and the City School Complex which includes Mondovi Elementary (Early Childhood, Four-Year-Old Kindergarten, Five-Year-Old Kindergarten, and Grades 1-5), Mondovi Middle School (Grades 6-8), and Mondovi High School (Grades 9-12). With an enrollment of approximately 975, the School District of Mondovi provides students the personal attention available to students in a small school district as well as the academic and extracurricular opportunities provided by larger school systems. The Mondovi community and school district staff are dedicated to providing high-quality educational facilities and programs. The focus within each of the schools is on providing the best possible learning opportunities for all students through strong academic, fine arts, vocational, special needs, and extracurricular programs. The District strives to maintain an educational environment that is friendly, supportive, and based on the concept that all children are able to learn and be successful. Community involvement is welcomed and encouraged, and all district facilities, including an outdoor swimming pool, distance learning lab, four computer centers, weight room, concert/performance stage, three indoor athletic areas, and outdoor recreational fields are open and accessible to the public.